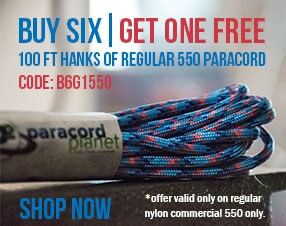 Paracord has long been a staple in the outdoor world. Since its beginning in WW2 as Parachute Cord its multitude of uses has skyrocketed ever since. It's now used by crafters, both avid and beginners, for animals, in furniture, and people are continuously finding more and more ways that paracord is useful in the outdoors. But one of the biggest ways it has transformed is in the world of preppers, hunters, and survivalists. If you're hunting close to home or far away, preparing for the apocalypse, or heading on a trek through the Himalayas, there are some paracord projects and hardware you won't want to be caught without. This bracelet's handiness is three-fold. 1) The eye-knife: This can be used to cut paracord quickly and in case if you get stranded somewhere, you can easily get sparks if it's struck against the flint rod. You don't even need to disassemble the bracelet to use the eye-knife! 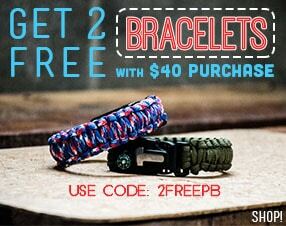 2) The paracord in this King Cobra bracelet can be quickly and easily taken apart. The bracelet itself is approximately 10 inches in length and when unwoven is approximately 20 feet of paracord that can be used to tie things together, burned to keep warm, or weaved into whatever you need. Paracord Planet sells the Adjustable Survival Fire Starter Paracord Bracelet in Olive Drab and Black. This buckle is like no other. It's so multi functional, it's an absolute necessity for any outdoor hobbyist or survivalist. The Emergency Utility Buckle not only has a scraper and flint rod to quickly and easily start fires, it also has a whistle for use in emergency situations. The 3/4" webbing is great so you have a variety of different weaves to choose from. Paracord Planet sells the Emergency Utility Buckle solo or on pre-made paracord bracelets. This survival paracord grenade packs a big punch in a small case. It comes with tinder, aluminum foil, an eye-knife, needle, wire, fire starter, weights, swivels, fishing hooks, floats, and fishing lines all wrapped up in about 9 feet of paracord! I think we can all see the value in this! These Paracord Grenade Kits are brought to you by OutdoorBunker. Monkey fists are also multi functional and diverse. You can make them with as small as a 3/4" ball bearing up to as big as with a 1 3/4" ball bearing. Any size steel ball bearing or spherical item will work! First, they're typically used as a weight or anchor at the end of a long rope making it easier to throw over a tree, from person to person, or even to throw between boats to bring them together. Second, its a tool you won't even want to leave home without. I won't speculate as to why or what you would need to hit with this, but as for a quick and discrete self-defense weapon to have on hand in the outdoors, this is prime. For a tutorial on how to make the Monkey Fist check out the video below. What would you add to this list? Tell us in the comment section below! Or as always, if you have any further questions please comment below or find us on Facebook, Twitter, Instagram, Pinterest, or Google+.